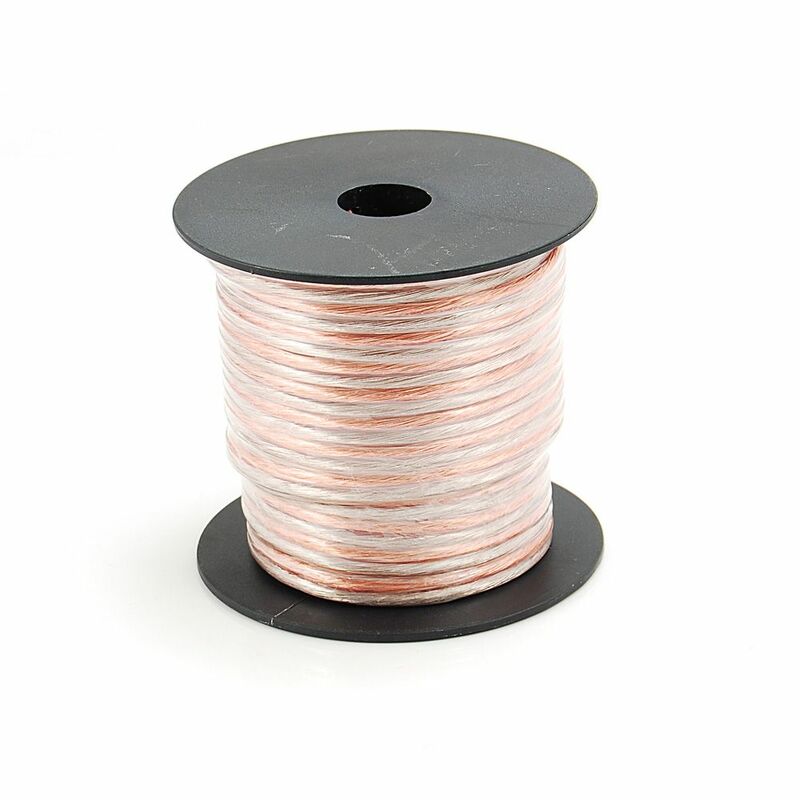 This 50 ft. 14-Gauge Speaker Wire features copper and aluminum conductors insulated and jacketed in PVC. It has very good flexibility. Use this wire to connect speakers to your stereo or home theatre receiver. The CE-TECH Stainless Steel Wall Plate Phone Mount helps you free up table and countertop space by installing your phone onto the wall. This phone mount offers a 4-conductor design. Ideal for satellite dish installations, the CE-TECH White Combination Coaxial/Phone Wall Plate offers connections for coaxial cable and a phone line. This wall plate offers solid construction for durability. This Electronic Master EM6814100 100-Ft 2-Wire Speaker Cable with 14-AWG is an integration of superior quality materials and technology that results in superior cables. Each cable has been carefully crafted from high-purity, signal-enhancing materials to ensure that your music and movies will always sound and look their best. This can be use with any speaker and audio equipments interconnect, it also easy to handle and installation. This Electronic Master EM6812200 200-Ft 2-Wire Speaker Cable with 12-AWG is an integration of superior quality materials and technology that results in superior cables. Each cable has been carefully crafted from high-purity, signal-enhancing materials to ensure that your music and movies will always sound and look their best. This can be use with any speaker and audio equipments interconnect, it also easy to handle and installation. 50 ft. 14-Gauge Speaker Wire This 50 ft. 14-Gauge Speaker Wire features copper and aluminum conductors insulated and jacketed in PVC. It has very good flexibility. Use this wire to connect speakers to your stereo or home theatre receiver. 50 ft. 14-Gauge Speaker Wire is rated 4.5 out of 5 by 32. Rated 5 out of 5 by HomeDepotCustomer from Easy to use and different wire colors make it easier... Easy to use and different wire colors make it easier to keep polarity correct. Rated 5 out of 5 by VernDelray from I replaced my old stereo speakers 18 gauge wire, which was pieced together, with this heavy duty ... I replaced my old stereo speakers 18 gauge wire, which was pieced together, with this heavy duty 14 gauge wire. I now get quality uninterrupted music without the cutting in and out. This sturdy wire is easy to work with. I will not use the thin 18 gauge wire again. Rated 1 out of 5 by HomeDepotCustomer from Nothing wrong with the wire. However, I purchased 50... Nothing wrong with the wire. However, I purchased 50 feet of wire. When I got it home and measured it the roll only has 48 feet 2 inches. I feel like I have been cheated out of about 2 feet of wire. If the package is going to say 50 feet shouldn't they have 50' on the roll?? VERY BAD!! Rated 5 out of 5 by Bob from What really helped was the employee that showed me alternatives... What really helped was the employee that showed me alternatives and helped me choose this product. I saved me time amd money and was the perfect choice. Rated 5 out of 5 by vinnie86 from I am pleased with this product as it meets my needs for now. Easy to use and lays flat pretty eas... I am pleased with this product as it meets my needs for now. Easy to use and lays flat pretty easily. I would buy this again when I'm in the need.